This ancient Welsh surname derives from the Old Welsh personal name "Grippiud", which gradually developed into "Griffudd", and "Gruffudd", and the early standard form "Gruffydd". The normal pronunciation of the name in South Wales became "Griffidd", and those medieval scribes who were not Welsh generally wrote "Griffith", as being the closest phonetic spelling within their writing system. 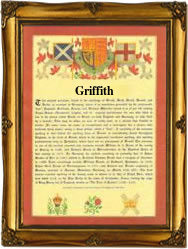 This form, Griffith, and Griffiths the patronymic came to be used almost universally, as forename and surname, throughout Wales. The first element of the name, "Griff", is of uncertain origin, but is thought to mean "strong grip", with "(i)udd" the second element meaning "chief, lord". The first recording of the surname in England occurs in 1524, when one Jone Gryffyth is listed in the Suffolk Subsidy Rolls. One Richard Griffiths was an early emigrant to the New World colonies, leaving London on the "Hopewell" in February 1634, bound for the Barbadoes. The first recorded spelling of the family name is shown to be that of David Gryttyth, which was dated 1295, the Lordship of Oswestry, during the reign of King Edward 1, known as "The Hammer of the Scots", 1272 - 1307. Surnames became necessary when governments introduced personal taxation. In England this was known as Poll Tax. Throughout the centuries, surnames in every country have continued to "develop" often leading to astonishing variants of the original spelling.